Felix Padel, an expert on mining conflicts in Odisha (India), has written a second blog for EJOLT – this time detailing the miscalculations of J.P Morgan in India. When Sterlite Industries set itself up in London as Vedanta Resources in December 2003 – via tax havens in Mauritius and elsewhere and a shady entity called Angel Trading – its Directors never guessed that their attempts to mine their chosen bauxite deposit on Niyamgiri would meet such opposition. J.P Morgan had brought out a Bookrunner’s report the previous month, which mentioned high casualty rates in the factories and on the roads from the mines at Sterlite’s subsidiaries Balco and Malco. It also mentioned the Niyamgiri deposit, but not the vital fact that, alone of Odisha’s bauxite-capped mountains, Niyamgiri was home to a particularly traditional tribal group called the Dongria Konds, let alone that a Dongria taboo on cutting forest on the mountain summit had preserved unique primary forest on Niyam Dongar, covering the coveted bauxite. As ‘non-economic’ information, this was presumably deemed irrelevant. The refinery was sited just below Niyam Dongar, right at the starting point of the Bansadhara river. This was one reason that the Centrally Empowered Committee, in its report submitted to the Supreme Court in September 2005, called for work on the refinery to be halted and clearance for mining the mountain to be withheld. Among many irregularities, the company applications for forest and environmental clearance had separated the planned bauxite mine from the refinery, meaning that the refinery was going ahead without ensuring that the mine would be allowed – an outrage considering the extent of forest cover over the deposit, and its location in the heart of Dongria territory! After the refinery started operation in 2006-7, Vedanta tried many tactics to get clearance for mining. Initially the Supreme Court case seemed to favor the company, giving the go-ahead for mining conditional on clearance from the Ministry of Environment and Forest, and calling for a Special Purpose Vehicle to be set up in which bauxite mining would technically be done by the Orissa Mining Corporation. But after a thorough review, the Ministry under Jairam Ramesh refused clearance in 2010-11. Vedanta’s AGMs in London have been attended by an increasingly diverse and vocal set of shareholder activists, confronting the Directors about human rights abuses and environmental destruction inside, while a demonstration is held outside. Amnesty International has reported these abuses extensively, and Survival International’s charges against Vedanta under OECD guidelines have been upheld. This year (2012) the demonstration was organized by a grassroots organization Foil Vedanta, without NGO logos. Obviously, without access to nearby bauxite, and problems in getting supplies from other sources, the refinery closed down on 12th October 2012, after appeals for another bauxite mine had failed. Immediately after this, the Odisha Electricity Regulatory Commission (OERC) declared the company’s attempts to avoid paying for electricity illegal, and ordered it to pay an astonishing 150 million rupees in unpaid fees (‘OERC whip on Vedanta’, Tathya, 14th October 2012). 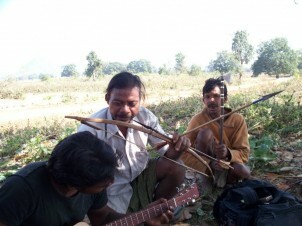 Problems for the Dongria continue: new roads into the heart of Niyamgiri have brought the timber mafia and incursions by the CRPF (Central Reserve Police Force), reported to have terrorized villagers in the name of searching for Maoists. Vedanta is unlikely to give up quietly, and pressure is mounting for clearance to mine many nearby bauxite capped mountains, each of which is defended by local communities. To the south, similar movements in Andhtra Pradesh received a boost when Tribal Affairs Minister Singh Deo used his position to declare bauxite-aluminium projects there unconstitutional (‘Andhra Pradesh urged to revoke bauxite mining pacts’, The Hindu, 3rd October 2012). Will Vedanta and similar companies be held accountable for their destruction of ecosystems and communities?